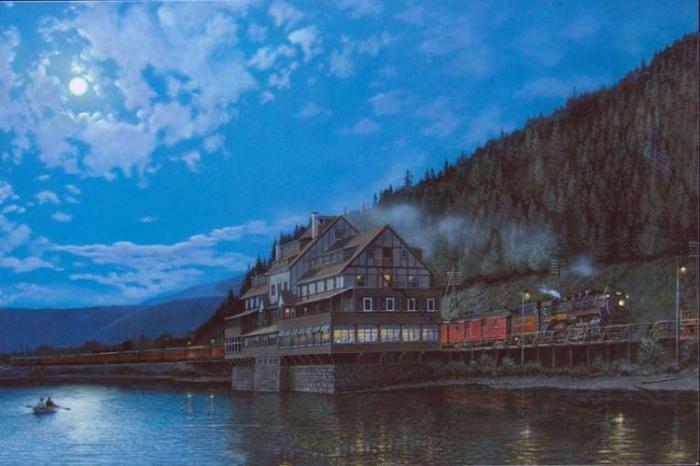 Image Size: 9" x 6" Framed Size: 14" x 11" The Hotel Sicamous (including the station) opened in 1900. This building stood just west of Sicamous Narrows Bridge on the edge of Shuswap Lake, until it was demolished in 1964. It had originally been built to provide dining facilities during a period when locomotives lacked sufficient power to haul dining cars through the mountains, but continued in use as a popular resort until 1956.